Love dragons? McLaren has made the perfect car for you. While this year’s Beijing Auto Show has been dominated by SUVs and China-exclusive EVs, McLaren has broken up the monotony with the reveal of a new bespoke 570GT. Developed by McLaren Special Operations in collaboration with Chinese fashion designer and entrepreneur Mr. Cabbeen, the unique 570GT is the first bespoke McLaren model to feature “distinctive Chinese classic design elements.” Finished in MSO Bespoke Obsidian Black, the car's most distinctive design element is a dragon adorning the door inserts. The Chinese dragon has has been hand-painted onto the supercar in Gloss Speedline Gold. Elsewhere, the new 15-spoke alloy wheels and brake calipers are finished in the same gold color. The car displayed at the Beijing Auto Show is part of the McLaren 570GT MSO Cabbeen Collection limited to just five examples that will be sold worldwide, unlike the recently-revealed . “McLaren Special Operations is dedicated to providing customers with tailored choices that offer them almost endless personalisation alternatives,” commented Ansar Ali, Managing Director at McLaren Special Operations. “As a fusion of contemporary British design style and Chinese classic art elements, the 570GT MSO Cabbeen Collection was created to satisfy Chinese customers' desire for individualisation and is further evidence of the growing interest in MSO services in the China market.” Inside, the Chinese dragon theme continues in the cabin, where sculptural dragons have been embroidered in gold on the Alcantara-wrapped center front tunnel and rear luggage deck. Designed by Mr. Cabbeen, the dragon motifs are an example of Chao Embroidery, which is recognized as part of China’s cultural heritage. The embroidered dragons on each of the five cars were sewn by Kang Huifang, the Director of the Professional Embroidery Committee of China's Arts and Crafts Institute, who has 40 years of experience in Chao Embroidery. 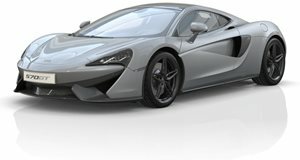 Mechanically, the dragon-themed McLaren 570GT is identical to the standard car. At its heart is a 3.8-liter twin-turbocharged V8 that sends 562 horsepower and 443 lb-ft of torque to the rear wheels through a seven-speed dual-clutch transmission. 0-62 mph takes just over three seconds before the grand-tourer tops out at 204 mph.